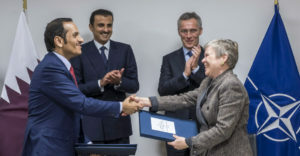 The NATO Wednesday crushed Qatar’s desire to join the alliance as its membership in the regional Gulf Cooperation Council has become shaky amid growing diplomatic tension with its neighbors. “According to Article 10 of the Washington Treaty, only European countries can become members of NATO,” an official told AFP on Wednesday. “Qatar is a valuable and longstanding partner of NATO,” the official added. The rejection came a day after Qatar’s defense minister Khalid bin Mohammad Al Attiyah told the official magazine of the Qatari defense ministry, Altalaya, that the country’s clear ambition was to become full member of the defense alliance. “Qatar today has become one of the most important countries in the region in terms of the quality of armament,” Attiyah said. Attiyah was speaking on the first anniversary of the diplomatic spat opposing it to its neighbors namely Saudi Arabia, United Arab Emirates (UAE) and Bahrain in addition to Egypt. The four severed ties with Qatar over its alleged support for terrorism in June 2017. Qatar dismissed the charge. The quartet has since then imposed a sea, air and ground blockade and even threatened Qatar’s membership in GCC. The diplomatic crisis has since deepened. Qatar last week banned food products stemming from the boycotting country. Saudi Arabia also threatened to assault militarily the tiny rich country over its plans to buy from Russian S-400 air defense missile system. Written by: KanelkaTagba on June 7, 2018. Posted by KanelkaTagba on Jun 7 2018. Filed under Gulf News, Headlines, World News. You can follow any responses to this entry through the RSS 2.0. Both comments and pings are currently closed.